FedEx officials presented aviation scholarships to 20 Indiana State University students on Wednesday (April 10). 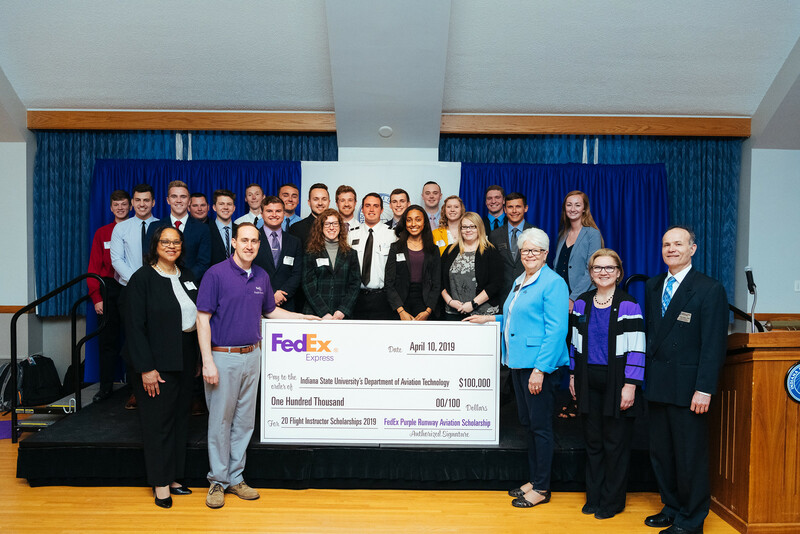 Indiana State received a $500,000 commitment from FedEx Express last fall as part of the corporation's $2.5 million Purple Runway Aviation Scholarship program. A subsidiary of FedEx Corp. (NYSE: FDX) and the world's largest express transportation company, FedEx Express created the scholarship program to build the next generation of aviation professionals. FedEx is collaborating with seven universities and technical schools that provide education and training for aspiring pilots, aircraft maintenance technicians and other aviation professionals. "FedEx has the best pilots, mechanics and aviation professionals in the industry," said Don Colleran President & CEO FedEx Express. "The FedEx Purple Runway Aviation Scholarship strengthens the education to aviation pipeline, and is just one of the many ways we're continuously innovating to attract the next generation of aviation professionals." "We appreciate FedEx's support of our professional aviation flight technology undergraduate program at ISU," said Nesli Alp, dean of the College of Technology. "FedEx's generous support will help us train more pilots, who are desperately needed in the workforce. We are delighted to partner with FedEx on this important initiative and look forward to collaborating with them to support our students and faculty." Professional aviation students incur additional costs for their education because of required flight fees, said Troy Allen, chair of the aviation technology department at Indiana State. "One of the biggest challenges for a young person to fulfill their aspirations of becoming a professional pilot is finances. This FedEx endowment has eliminated a considerable portion of that challenge," Allen said. "It is a very exciting time to be pursuing an aviation degree at Indiana State University. Speaking on behalf of the aviation faculty and our students, I wish to express our heartfelt gratitude for this gift from the awesome FedEx team that visited our campus. We are so very proud of all of our students and what they are working so hard to achieve. Truly, they are why we are here, and we are pleased to have FedEx come along side us with the shared goal of insuring their future success." The FedEx Purple Runway Aviation Scholarship is an extension of the company's aviation pathways program. This industry-leading pilot development program is designed to assist two FedEx Express feeder operators with the recruitment and retention of pilots who wish to develop their skills and experiences to eventually qualify for pilot opportunities at FedEx Express. More information is available at fedexpurplerunway.com. FedEx Express is the world's largest express transportation company, providing fast and reliable delivery to more than 220 countries and territories. With annual revenues of $69 billion, FedEx Corp. offers integrated business solutions through operating companies competing collectively and managed collaboratively, under the respected FedEx brand. Consistently ranked among the world's most admired and trusted employers, FedEx inspires its more than 450,000 team members to remain focused on safety, the highest ethical and professional standards and the needs of their customers and communities. Photo: https://photos.smugmug.com/Events/Events-by-Year/Campus-Wide-Events-2019/FedEx-Takeover-2019/n-T9km4j/i-mMDZwFB/0/3ab13f98/X3/i-mMDZwFB-X3.jpg -- Scholarship recipients pose for a photograph with officials from Indiana State University and FedEx on April 10.